Quadrel’s Pharmaceutical labeling systems includes a printer or imprinter, code verification, bottle and label tracking, pharmacode or barcode verification and “Assume False-Prove True” programming logic. The system’s output obtains 100% inspection for FDA compliance. This heavy-duty, high-performance labeling system was designed to apply wraparound labels to 3ml and 10ml cylindrical glass vials. This machine was designed specifically to meet the demands of a 24/7 operation and features stainless steel construction, shaft driven product handling and a raised bed sanitary conveyor. 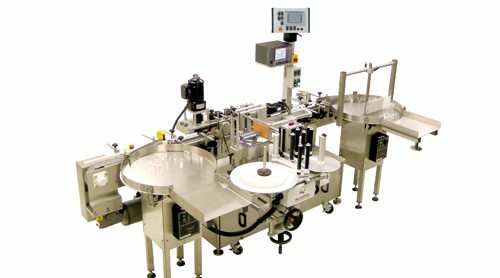 To insure accurate and consistent product handling a custom wrap station and vertical roller assembly were designed specifically for this machine. The vertical roller assembly stabilizes and controls the glass vials and references the container sidewall as the label is being applied. This minimizes the challenges of dimensionally inconsistent glass. This system also features a “closed-loop” servo motor label drive to insure superior web control and improved applied accuracy. The dual remote powered unwind provides minimal label changeover time. Quadrel continues to provide quality systems to meet the stringent demands of the pharmaceutical industry.